The Energy Information Administration (EIA) released its weekly data on diesel and gasoline retail prices for the week ended January 9th, 2017. Both gasoline and diesel prices continued to rise, marking the sixth consecutive week of price hikes following the November 30th OPEC meeting. A variety of refinery issues caused localized issues, but ample inventories moderated price spikes. For the current week ended January 9th, diesel prices rose by 1.1 cents to an average price of $2.597/gallon. PADD 1 retail diesel prices rose 2.1 cents to $2.648/gallon. In New England, prices rose 1.2 cents to $2.677/gallon. Central Atlantic diesel prices rose 3.7 cents to average $2.813/gallon. Lower Atlantic prices rose 1.2 cents to average $2.526/gallon. Overall PADD 1 prices were 41.9 cents/gallon above their prices for the same week last year. 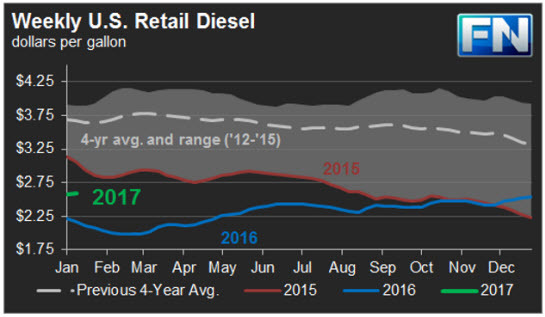 In the Midwest PADD 2 market, retail diesel prices increased 0.7 cents to average $2.547/gallon. This price was 45.1 cents/gallon above its level for the same week last year. In the Gulf Coast PADD 3, retail diesel prices declined slightly, by 0.3 cents, to $2.448/gallon. This price was 36.8 cents higher than in the previous year. In the Rocky Mountains PADD 4 market, retail diesel prices increased 0.6 cents to $2.541/gallon. This price was 40.7 cents higher than in the prior year. In the West Coast PADD 5 market, diesel pump prices increased by 2.6 cents, to $2.873/gallon. This price was 44.7 cents above its level last year. Prices excluding California rose 2.2 cents to $2.774/gallon, which was 51.6 cents above the retail price for the same week last year. California diesel prices rose 1.7 cents to $2.953/gallon, 39.1 cents higher than last year’s price. 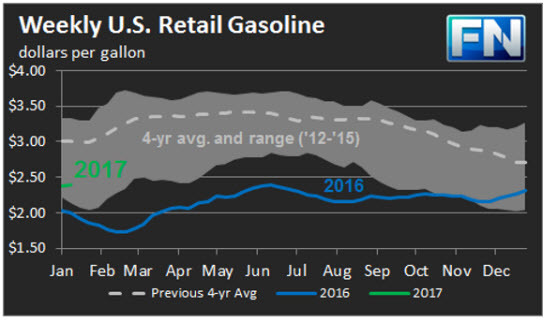 US retail gasoline prices rose 1.1 cents for the week ended January 9th, to $2.388/gallon. This price was 39.2 cents higher than for the same week in 2016. In the East Coast PADD 1, prices for gasoline rose 0.9 cents to $2.395/gallon. This price was 42.5 cents higher than last year’s price. Prices increased 0.7 cents in New England to $2.378/gallon. Central Atlantic market prices rose by 1.9 cents to $2.515/gallon. Prices in the Lower Atlantic market edged up slightly, by 0.3 cents, to bring prices to an average of $2.31/gallon, 41.4 cents higher than last year’s average price. In the Midwest PADD 2 market, gasoline prices receded 0.3 cents to average $2.344/gallon. Gasoline pump prices were 53.2 cents higher than they were one year ago, the largest year-on-year price increase among the five PADDs. In the Gulf Coast PADD 3 market, prices increased 2 cents to average $2.168/gallon. Prices for the week were 44.1 cents higher than for the same week in 2016. In the Rocky Mountains PADD 4 region, gasoline prices rose by 4 cents to average $2.175/gallon. This price was 20.3 cents higher than at the same time in 2015. In the West Coast PADD 5 market, retail prices rose 2.9 cents to an average price of $2.68/gallon. This was only 5 cents higher than at the same time a year ago, whereas the U.S. average price was 39.2 cents higher year-on-year. Excluding California, prices rose 3.5 cents to an average of $2.465/gallon. This was 20.2 cents higher than at the same time in 2015. California prices increased 2.5 cents to reach an average pump price of $2.804/gallon, 3.8 cents lower than last year’s price for the same week. Los Angeles prices rose 2.8 cents to 2.888/gallon. This price was 17.7 cents lower than the price for the same week in 2016. San Francisco pump prices rose by 2 cents to average $2.82/gallon, 8.2 cents above last year’s price. Seattle prices increased 6.8 cents to average $2.728/gallon, 26.6 cents higher than prices one year ago.